A couple weeks ago, Serious Eats published an article on the clam and black bean sauce noodles at Fung Tu. They interview Chef Jonathan Wu and follow him step by step through a dish that is “a simple one, and easy enough for home cooks to adapt to their kitchens.” There’s enough detail in the article that you can figure out most of the recipe, but there’s no actual recipe published. (Not surprising, I don’t blame Wu at all for not wanting to make it that easy.) Moreover, the steps Wu follows make about 12 servings of noodles. I don’t know about you, but I usually don’t cook for quite that many mouths in one sitting. Well, this sounded like a challenge. Could I figure out how to replicate the dish and adopt the recipe for say, four servings? It helps that one of the key ingredients is manila clams, and I happen to be working for a company that sells manila clams. So after rustling up the other ingredients and doing some educated guesswork, I came up with the recipe below for the noodle dish. My only problem was that more clam broth was generated than needed for the noodles. I ended up reserving about 1.5 cups of the broth and freezing it for later. If the full amount had been used, the noodles would have ended up far too soupy and salty. The chili oil was also a bit of a conundrum, since Wu lists the ingredients that he uses (neutral-flavored oil, dried chilies, smoky chipotles, fresh chilies, garlic, confit shallots, fermented black beans and tomato paste) but no proportions. In the absence of any guidance, I simply made something up based on what I had already in my kitchen. Mix the vinegar, salt and sugar until it dissolves. You can microwave the vinegar a little to make the solids dissolve faster. Add the sliced onion and just enough water to cover. Shake well and refrigerate the onions for at least an hour. Put all of the above ingredients into a blender or food processor and blend until combined. Adjust to taste. This comes out pretty thick and saucy, so it’s not really a chili oil like the one at Fung Tu. You could thin down the sauce with more oil, but I decided I liked it the way it was and didn’t want to make it less healthy by adding more oil. Rinse the manila clams thoroughly in a colander. 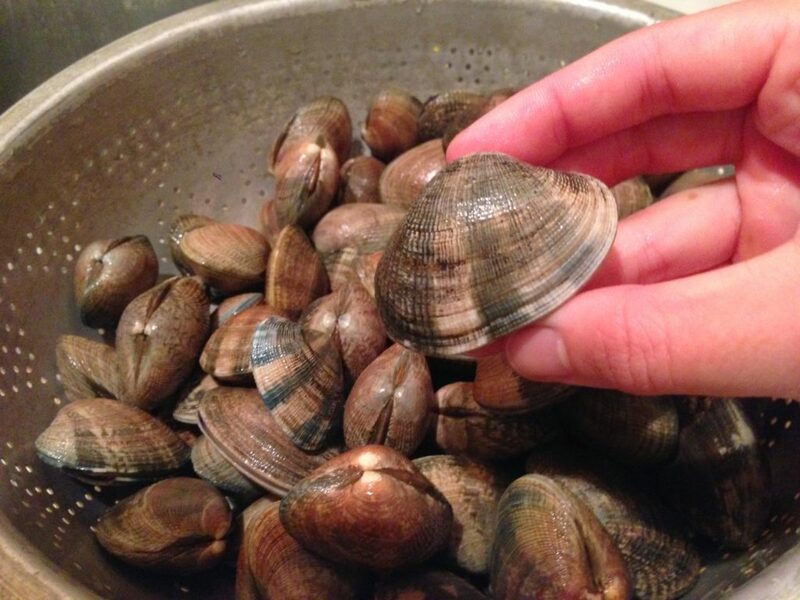 If you are worried about sand or grit inside the clams, purge them by putting them in a large container, cover them with plenty of sea salt and fill the container with water. Wait for at least an hour, then rinse them off again. Next, heat some olive oil in a large saute pan and sweat the shallots for 1-2 minutes. 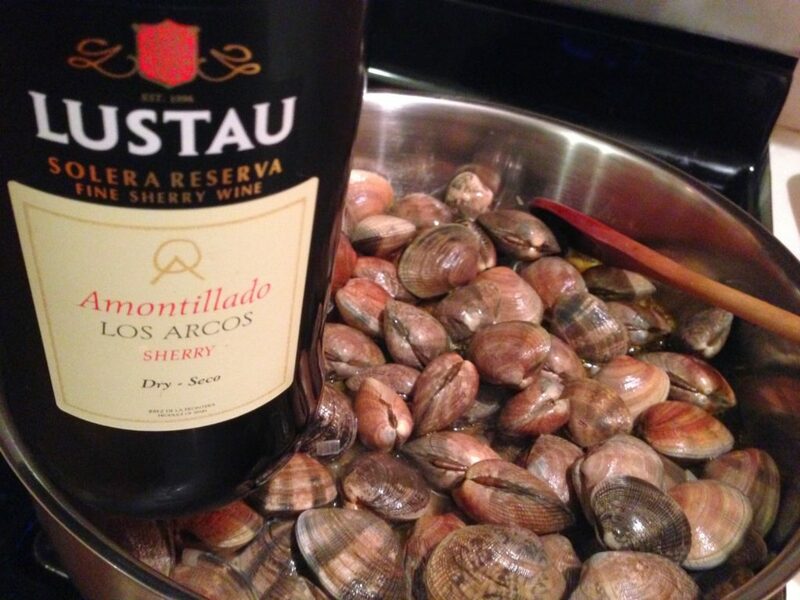 Add the clams, then add the sherry. Cover the pan and let the clams steam over low heat. Like popcorn, you’ll hear the clams popping as they open. After about 5 minutes, most of the clams should be open. Drain the clams, making sure that you save all of the clam broth. Pick the meat out of the shells (I use a paring knife to scrape out the meats), then chop it into small pieces. 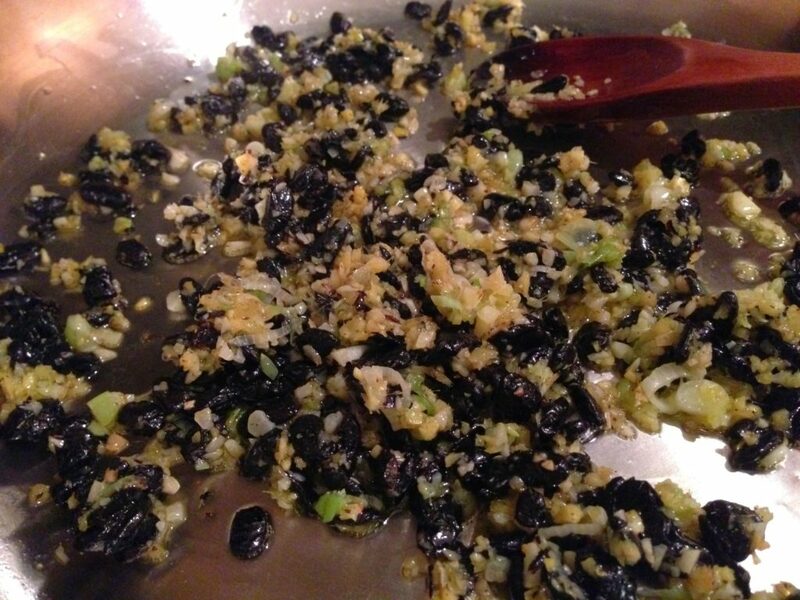 In a clean pan, heat more olive oil and add the minced scallion whites, ginger, garlic and fermented black beans. Let everything sweat for about 2-3 minutes. Let the aromatics cool, then combine with the clam meat, keeping the clam broth separate. Meanwhile, boil water and drop the egg noodles in to soften them. They are pre-cooked, so you only need to heat them through for 1-2 minutes before removing and draining them. 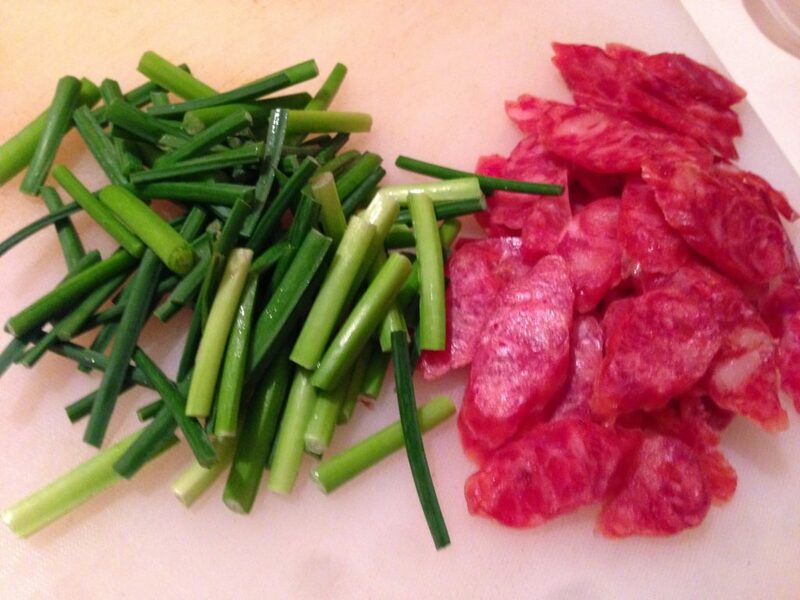 Finally, heat some olive oil in a wok and add the sausage pieces and garlic chives. Toss for 30 seconds, then add the noodles, clam mix and enough clam broth to coat the noodles. (Don’t add all of the broth in at once, or it might be too much.) 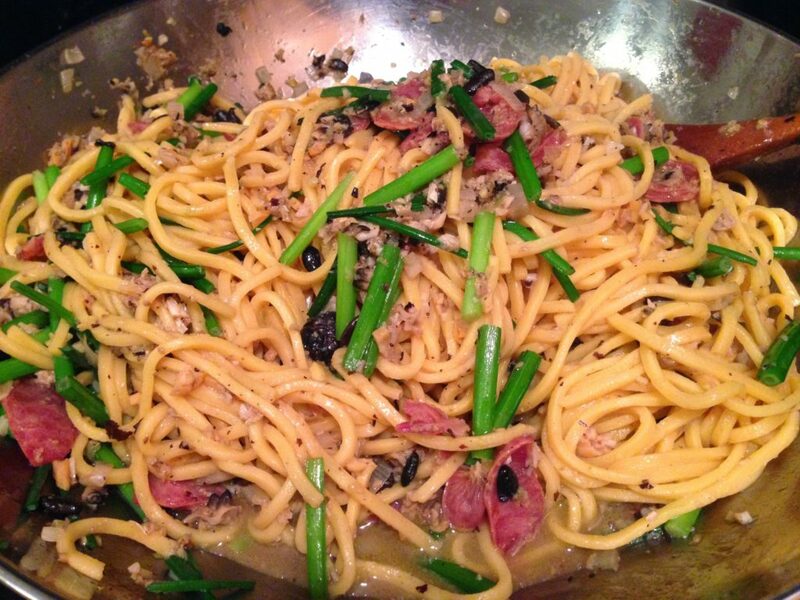 Cook and reduce the sauce for a few minutes to make sure each noodle is thoroughly coated. Serve the noodles topped with pickled onions and a dollop of chili sauce. Note that the toppings are key for balancing the dish, don’t skip them!